Activists are asking the public to attend a rally in Amherst on March 2 to show their solidarity with government workers in Wisconsin. Tens of thousands of workers have been rallying at the Wisconsin state capitol in recent days to protest anti-union legislation proposed by that state’s governor. Similar legislation is pending in several other states. Experts say the trend will likely affect workers in Massachusetts, New Hampshire, and Vermont. It takes about 15 minutes to walk to the rally location from downtown Amherst. 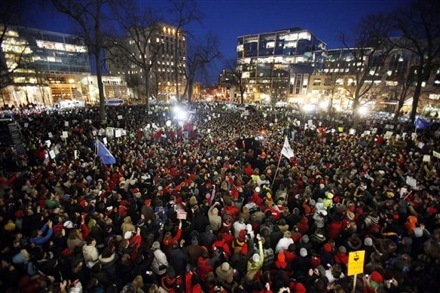 This photo shows protesters in Madison, Wisconsin on February 18.